Rigid core luxury vinyl flooring is known by experts in the industry as WPC Vinyl 2.0. 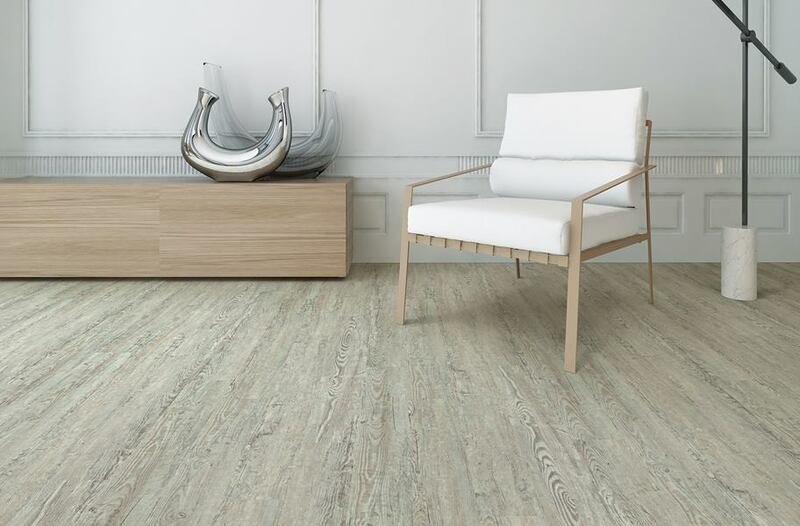 This new, improved waterproof vinyl option with an ultra-durable stone plastic composite core is the most durable waterproof vinyl flooring option on the market and a must-have for commercial spaces. It seems like just yesterday that WPC vinyl was the new talk-of-the-industry flooring product. I mean, to be honest, it’s only been the “it” thing for the last few years, which is still considered pretty new in the flooring world. I’ve spoken before about the technological revolution transcending into flooring. It sounds crazy, right? Like, flooring doesn’t really seem like something technical, but manufacturing and waterproof properties really are. And they just continue to expand and evolve. 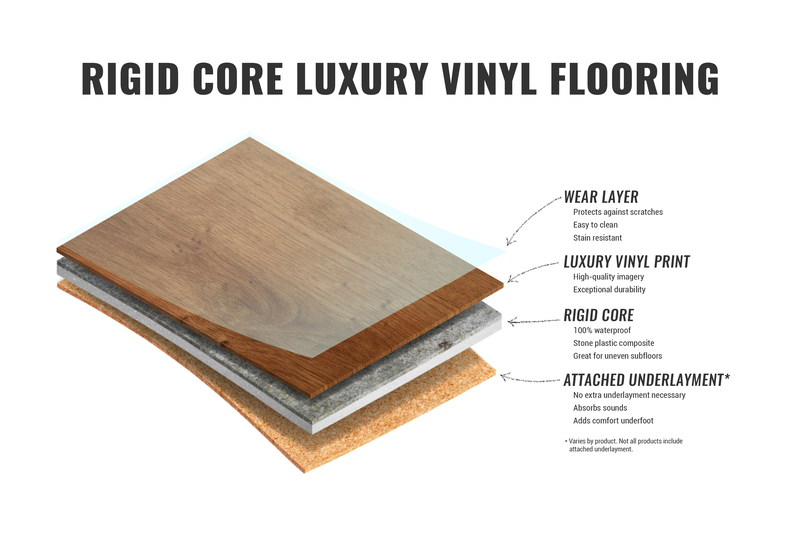 So what is rigid core luxury vinyl flooring anyway? Let’s take a look. 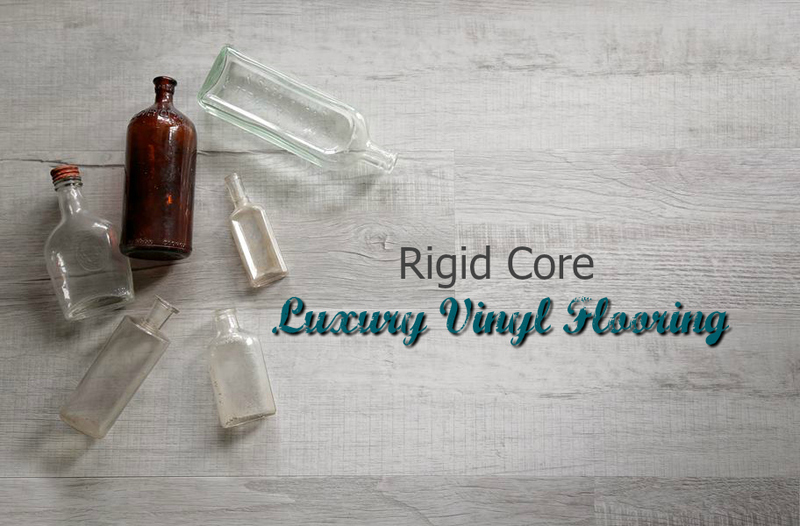 What is Rigid Core Luxury Vinyl Flooring? Rigid core luxury vinyl flooring, also known as SPC flooring, is the most durable waterproof vinyl flooring option on the market. You know how vinyl has a reputation for being flexible and less sturdy than traditional wood or laminate? Well, WPC vinyl is pretty darn sturdy, but SPC rigid core luxury vinyl flooring is like standing on concrete. 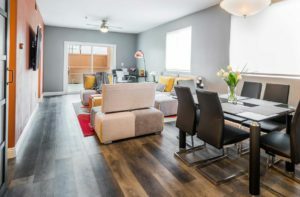 This small, thin flooring may seem like it doesn’t have much unf to it, but it is the toughest of the tough, specially designed to withstand the use and abuse of commercial environments. Like WPC, SPC rigid core vinyl flooring is the top of the line for not just functionality but looks, as well. 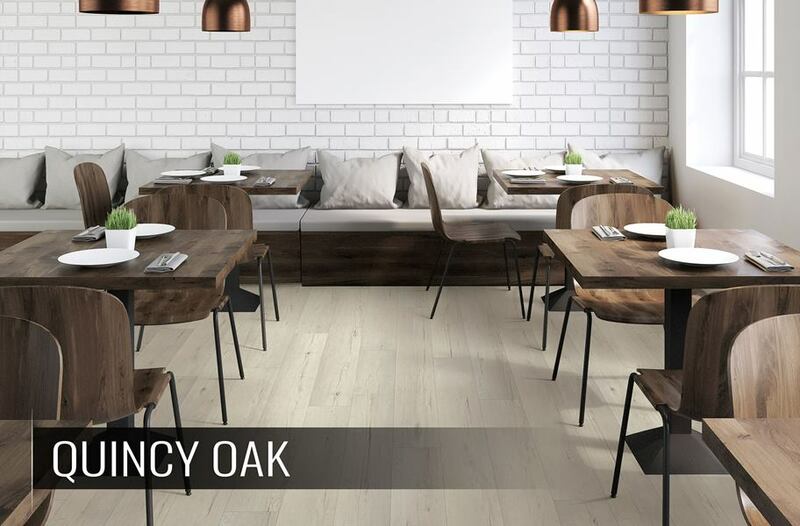 With rigid core vinyl, you’ll see all the hottest wood and stone-look trends and colors in beautiful, convincing planks and tiles. SPC is industry lingo for Stone Plastic Composite or Stone Polymer Composite (these terms are used interchangeably). It describes the ultra-tough core of rigid core luxury vinyl flooring. The stone plastic composite makes that core layer virtually indestructible, maintaining its form even on top of uneven subfloors. I’m glad you asked! 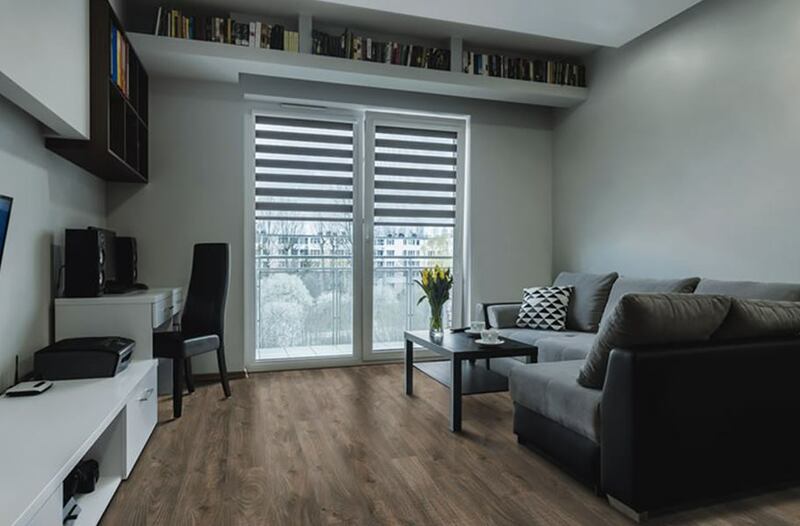 It means you can install SPC rigid core luxury vinyl flooring on any level, over almost any existing (hard surface) subfloor and for any amount of traffic. This is the backbone of your plank. This is the main attraction! SPC flooring contains a solid, waterproof core. It won’t ripple, swell or peel no matter much liquid you subject it to. This core is ultra-dense with no foaming agents like you’ll find in traditional WPC flooring. It gives you slightly less resilience underfoot, but it makes the flooring a superhero in the durability department. This is where you get your gorgeous photo imagery that makes the vinyl look (nearly) identical to natural materials like stone and wood. Often, rigid core luxury vinyl flooring is the highest quality vinyl on the market. This means you get the most realistic looks that people will swear are real wood/stone! Just like with traditional vinyl, the wear layer is like your bodyguard; it helps protect your floor from dents, scratches, etc. The thicker the wear layer, the buffer your bodyguard, you feel me? SPC flooring is known for having a buff, beefy wear layer offering more protection. When you look at vinyl flooring, it’s just as (if not more) important to look at wear layer thickness as plank thickness. So if SPC Rigid Core and WPC are both waterproof vinyl flooring options, what’s the difference? And why would you pick rigid core over WPC? The meat of both WPC flooring and rigid core flooring is the waterproof core. In WPC flooring, this is made from wood plastic composite, while with SPC, it is made from stone plastic composite. The stone is stiffer, sturdier and less resilient. Imagine WPC flooring as your plush, luxurious home carpet. It’s soft and wonderful, but it’s not as durable or easy to maintain as a low-pile commercial carpet. SPC rigid core is this commercial carpet. 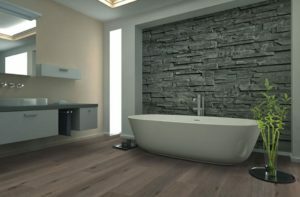 The planks/tiles are thinner, less giving under foot and ultra-sturdy and durable. It’s no surprise then that SPC rigid core luxury vinyl flooring is traditionally used for high-traffic commercial spaces. It is unbending unlike traditional vinyl and virtually indestructible. Structurally, the WPC core contains added foaming agent to increase resilience and comfort. The SPC has no foam added, giving it a stronger, more robust core. When it comes to scratches, both SPC and WPC are dependent on the wear layer. You’ll find options from 8MIL all the way to 20MIL+. The thicker the wear layer. the better your floor will hold up. As far as dents from heavy furniture, SPC rigid core is less susceptible to this than WPC flooring due to its, well, rigid core. That’s what makes it great for commercial environments. No matter how much traffic you see, SPC rigid core can take it. This is where things get really different. With rigid core, the thickness of your vinyl really doesn’t matter. Everything you’ve ever read about vinyl flooring says “thicker = better”. And that has been true for a long, long time. But! Now, the flooring manufacturers have thrown us for a loop creating an ultra-thin, super-durable option. Rigid core luxury vinyl planks and tiles are specially manufactured to be ultra-thin and light, usually measuring no thicker than 6mm. 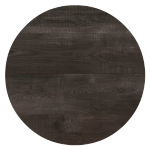 It’s funny because you look at the flooring and it looks thin and flimsy and you think “No way that’s the most durable vinyl flooring option on the market!” But, it is! Just try giving it a bend. It doesn’t matter how strong you are; that SPC core is stronger. The wear layer is the top surface of your rigid core vinyl flooring. Like I said earlier, the wear layer is like the bodyguard for your floor. If your options were a scrawny little thing, or a big, bulky, tough and ready-for-battle bodyguard, obviously you’d want the latter. While no bodyguard (wear layer) is perfect, there are a wide range and great options for every use and price point. Pretty simply put, thicker = better. Yes; for wear layers, this is still true. The thicker the wear layer (or, the higher the MIL number), the more resistant your floor will be to scratching and scarring. Which wear layer do you need? Well, let’s take a look at our options. 12MIL. Although it’s the lowest option in rigid core, 12MIL is still pretty thick – definitely thick enough for any home and for less busy commercial areas. 20MIL. This is the most common wear layer for commercial environments. 22MIL. The best of the best. 22MIL is as scratch-resistant as vinyl flooring gets, specially designed to hold up in the most intense commercial environments. It’s 100% waterproof. I mean, this is the trademark of both rigid core and WPC vinyl. It’s perfect for business owners, pets and water-prone areas. Perfect for imperfect subfloors. This is the other trademark of rigid core luxury vinyl flooring. All WPC vinyl is great for uneven subfloors, but rigid core is specially designed for these types of situations, engineered to be installed over any existing hard surface, including tile. Ultra-durable. SPC vinyl flooring is the toughest, most durable vinyl flooring option on the market. 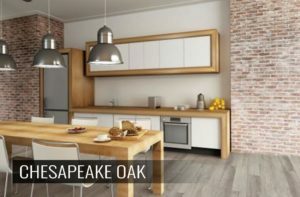 Realistic wood and stone looks. Seriously, vinyl is changing. Rapidly. The top-end vinyl floors mimic natural materials better than ever before. SPC vinyl is the best of the best, which means the looks are usually incredibly convincing and beautiful. Zero maintenance. All you need is the occasional vacuum and damp mop to keep your floor looking fabulous. Kiss the phthalates goodbye. 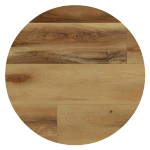 Many of our SPC flooring options are phthalate-free. Just check the product highlights to be sure. No expansion/contraction. One big worry for traditional wood flooring is expansion and contraction causing shifting or buckling in the floor. Rigid core does not expand or contract, even when moisture is present. Easy, DIY installation. Rigid core luxury vinyl tiles and planks are easy to install yourself with most options interlocking and floating over your existing surface. Sound absorbent. The SPC core of rigid core luxury vinyl flooring helps absorb sound, making it great for second story businesses. Extra warmth. Rigid core is known for providing extra warmth, especially compared to cold ceramic tile. Less comfortable underfoot than WPC. Manufacturers designed rigid core to be sturdy, not comfortable. That’s why it’s so popular in commercial environments. Price. SPC flooring comes with a lot of bells and whistles and the price can reflect that. Although, as more and more companies develop their own rigid core lines, we are starting to see prices drop and become more affordable. Also, it’s still less expensive than solid hardwood with way less maintenance. 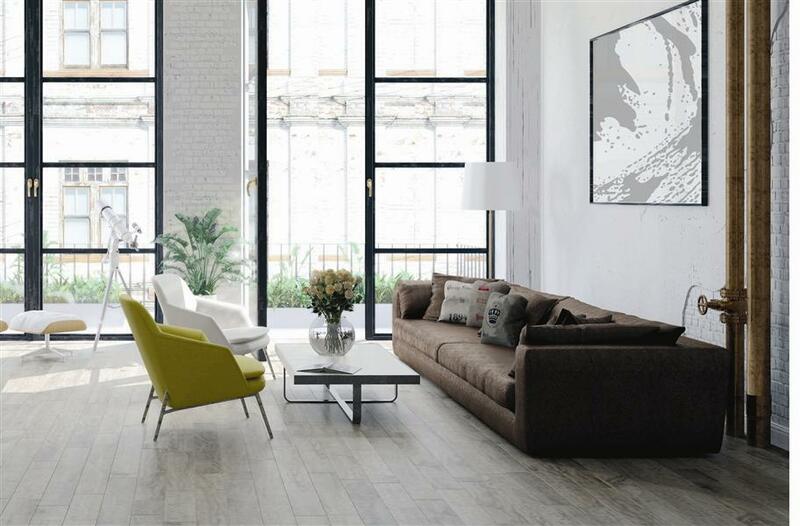 Where Should You Use Rigid Core Luxury Vinyl Flooring? Commercial & high-traffic areas. Particularly, commercial kitchens and bathrooms that see a lot of traffic and need a waterproof floor. It’s also extremely popular in grocery stores and other environments where spills happen frequently. Kitchens. If you’re like me and your kitchen sees lots of traffic, you might consider going the SPC rigid core route. You can always purchase an anti-fatigue mat to place over the areas you stand the most for added comfort. Bathrooms. Because of its waterproof capabilities, rigid core luxury vinyl flooring is a great option for providing a gorgeous, realistic wood or stone look in your bathroom. Basements. Basements are prone to flood and water damage so waterproof rigid core flooring is a great option. Additionally, you typically don’t spend as much time standing in a basement so the lower resiliency isn’t a big drawback. Who Should Choose Rigid Core Luxury Vinyl Flooring? Just kidding. Well, probably not. Chances are if you’ve made it this far and you’re still interested in what rigid core has to offer, it’s probably a great fit for you. Almost anyone can benefit from rigid core’s waterproof features and durability. Here are a few types of people we highly recommend it to. Business owners. 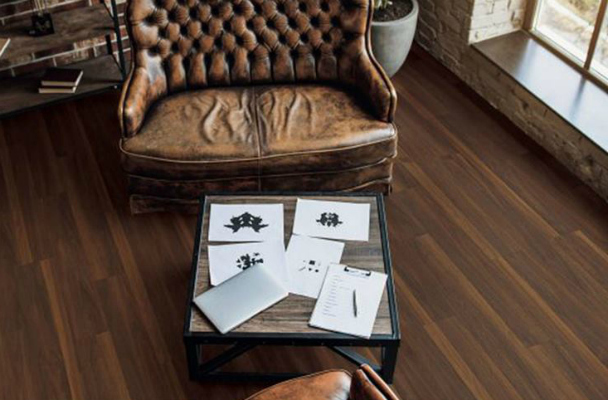 Like I’ve mentioned, rigid core luxury vinyl flooring is designed with business owners and commercial spaces in mind. It is the most durable waterproof vinyl flooring option on the market. And, its sharp looks keep your business looking modern and stylish. Pet owners. We know pets can completely wreck a floor between accidents, nails and running, but rigid core is built to handle it. It’s also less slippery on those little puppy paws than laminate options. DIYers. Most likely, you won’t need to rip out your existing subfloor. Just interlock and float your rigid core vinyl over your existing surface. *Note: Rigid core can be installed over most uneven subfloors. If the imperfections are extremely large, some leveling may still be necessary. You can find rigid core luxury vinyl flooring in just about every popular wood and stone color and look. 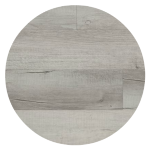 You’ll see lots of trending grays as well as blonde, honey and espresso wood looks. Good news! Just about every rigid core luxury vinyl flooring option is extremely DIY-friendly. 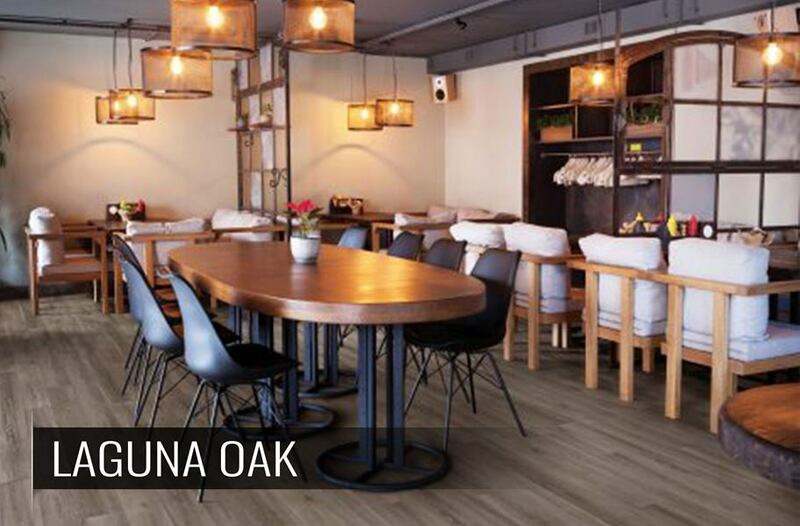 These tiles and planks feature a tongue and groove interlocking installation that allows you to easily click and lock the floor together just like traditional laminate. Instructions vary from product to product, but here is an example of what a typical installation consists of. Place your first plank with the tongue side facing the wall. Press the end seam of the second plank into the end seam of the first plank, and then lock them together by laying the plank down. Continue working left to right. Install the first plank in the second row by inserting the tongue into the groove of the plank in the first row. Continue through the process until all planks are installed. Protect all exposed edges by installing wall molding and/or transition strips. Make sure that no plank will be secured in any way to the subfloor. Mark the measurement then use a utility knife and straight edge to score the plank. Turn the plank over and bend it back along the cut. Use your utility knife to cut the back in the same spot. Curious about what others think of rigid core vinyl flooring? Check out a couple rigid core luxury vinyl flooring reviews. So glad you’re loving your waterproof vinyl, Jason! Temperature fluctuation questions/experiences…Is SPC is more stable for lower temps?? or in 3 season homes? ?… I live in the New England Area.. We have customers that have cabins on a lake.. The SPC has a harder surface?? Not a lot of info out there that states this.. Both WPC and SPC floors can be installed in a room that has temperature fluctuations, but, actually, SPC floors tend to perform better than WPC when it comes to extreme temperature changes. SPC floors have a denser core which makes them more resistant to expanding and contracting in extreme temperatures than WPC floors. Ok, I see that WPC = wood plastic composite, where SPC = stone plastic composite. Rigid core is SPC flooring- a stone composite center that makes it “rigid.” It is also waterproof. WPC is also waterproof, but has a more flexible core material, making it more comfortable. I have 2 layers of old linoleum flooring in my kitchen, it is 1/8″ thick. I was going to install vinyl planking but installer said I would have to rip out the lino, because it was two layers, and that the floor would move. Is it ok to install Stone Polymer Composite vinyl planks right over the lino? Thank you for your question. 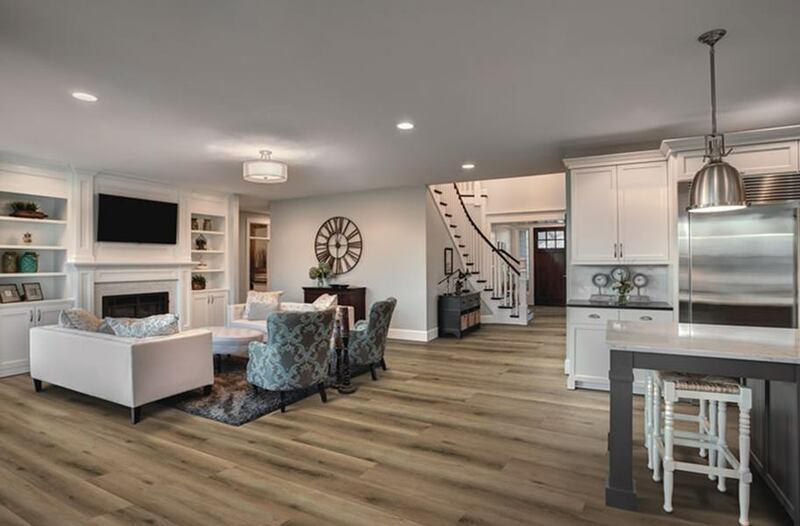 SPC vinyl plank flooring can be installed over any existing floor. Just be sure to clear the linoleum of any debris and mop and dry the floor first. You’ll also want to level the floor if the surface has any embossing or seams. Hope this helps, good luck with your project! Phthalate-free, Greenguard Gold certified vinyl flooring with a 100% waterproof rigid core. 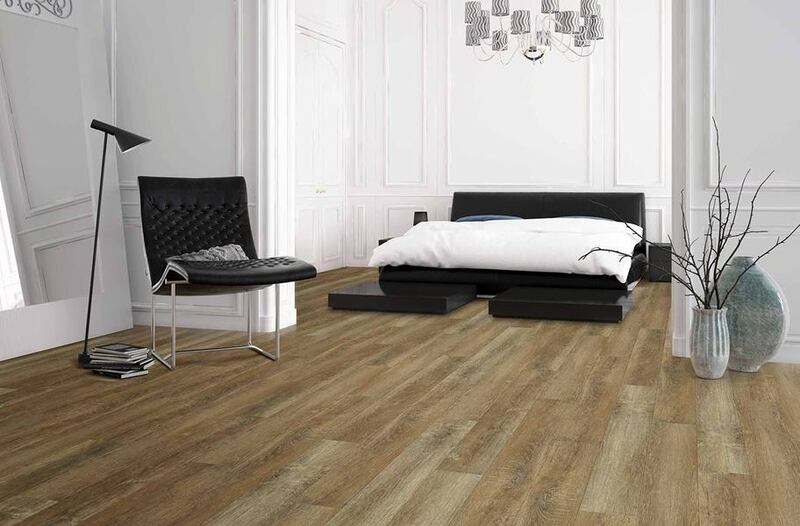 Super popular and affordable rigid core luxury vinyl flooring in gorgeous wood looks. 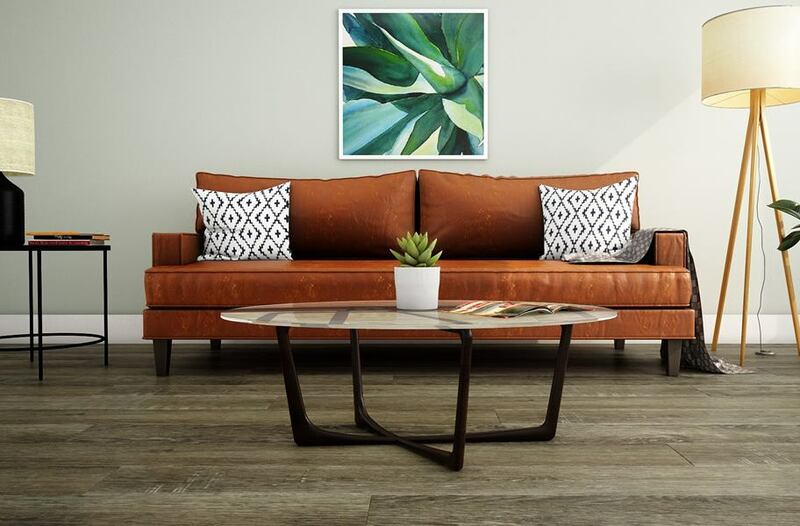 Gorgeous, rustic rigid core planks with painted-bevel edging and a lifetime residential warranty. 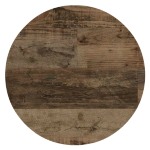 100% recyclable rigid core planks with an ultra-tough, scratch-resistant 28MIL wear layer. Classic, traditional rigid core vinyl with an enhanced UV quarts wear layer.